Creating a flavorful, good-textured sauce from your cooking juices is one of the truest tests of a cook's skill, whether at home or in the fanciest of restaurants. A sauce should ideally be thick enough to cling to your foods, adding flavor and moisture. Usually you'd do that with flour or cornstarch, but some cooks look for alternate methods because of food allergies or simple dietary preference. For example almond flour can be used to thicken sauces, though it's not a direct replacement for starch thickeners. Most of the common thickeners you would use in the kitchen are starches derived from grains or tubers such as flour, cornstarch, arrowroot and potato starch. They all work in much the same way. The starch molecules begin to absorb water and swell when you add them to your liquid. As the temperature rises, the tightly wound molecules begin to relax and loosen. As they do, they begin to form bonds with other starch molecules. At a certain temperature -- it varies, between starches -- the molecules rapidly form a broad network that immobilizes liquids like a sponge. The result is a very soft gel, which gives your sauce its pleasing consistency. 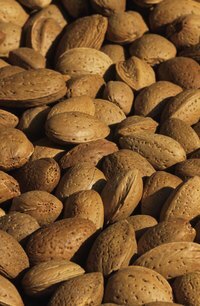 In the Middle Ages nuts were often used to thicken sauces, especially in the Mediterranean. A few regional specialties such as romesco, picada and Genoa's famous pesto sauce are still thickened with nuts, and so is Mexican mole. Nuts an thicken a sauce effectively, but through a different mechanism. In part, it's because the dry nut particles absorb free liquid from the sauce. Tiny droplets of nut oil also disperse through the liquid, thickening it through emulsion. It's the same process you see when oil emulsifies with lemon juice and eggs to make mayonnaise. If you're using almond flour to thicken your pan juices, you don't need to mix it first with cold water as you would with starch thickeners. It won't form clumps in the sauce, so you can simply sprinkle it over the liquid and whisk it in with a fork or wire whisk. Keep stirring and adding the almond flour in small amounts until you're satisfied with the consistency, then serve the sauce with your food. You can also use almond butter to thicken your sauce, adding small amounts at a time and whisking them vigorously into your pan juices. The result is much the same. Almond-thickened sauces are a good alternative for anyone cutting carbs or catering to a food allergy, but there are a few points you should know. For one, a nut-thickened sauce is always relatively heavy. Compensate by using small portions, and flavoring them intensely. Sauces thickened with almond flour will usually have a slightly gritty texture, especially if the flour is homemade. They'll also give your sauces a distinctive flavor, which is not unpleasant, but is definitely separate from the flavor of your food. Keep that in mind when you're planning your meal, and choose an entree such as chicken that will play nicely with the almond flavor. Can I Freeze Creme Anglaise?